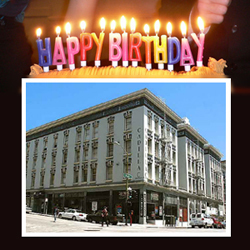 On September 19 from 5:00-7:00pm, San Franciscans will have a unique opportunity to get a living history lesson in one of the city’s most storied buildings. The Cadillac Hotel is celebrating its 100th Birthday, and will open its doors for an event featuring comments from former residents, a slide show on the hotel’s revival in the 1970’s, food, music (on the Hotel’s 19th Century Steinway concert grand piano), photos of the hotel’s history, and much more. Those were the golden years of San Francisco, and the Cadillac’s mammoth size—180 rooms plus a ballroom, in addition to significant ground-floor retail space—made it a popular destination for those visiting the city on a short-term basis. But the tenants decided they liked the changes. They were happy to have the caring management of Leroy, his wife Kathy, and legendary hotel manager Sarah Kearney. A photo at the September 19 party will show Kearney in her daily act of sweeping in front of the hotel. One would not know from the picture that anyone sitting against the hotel, or trying to deal drugs, would become the target of Kearney’s broom. This is not some Tenderloin myth—-I saw Kearney in action when I worked across the street from the Cadillac in 1984. When Looper and Kearney talked about “cleaning up” the area in front of the Cadillac—which was a major drug corner prior to 1978—-they meant this literally and figuratively. Leroy Looper’s remarkable life history has been set forth in his autobiography, much of which Beyond Chron published earlier this year. Looper will give his own perspectives on the Cadillac’s journey at the September 19 party. This is an event that anyone who cares about the history or future of San Francisco will want to attend. And like all Cadillac events, admission is free.